After reading the first article and getting our masking and primer done, let’s remove the masking, and clean up any bleeding. After the primer paint dries we’ll mask for design, effects, and parts then lay down our base coat paint (the main color of your body). Once your first coat of paint has dried, if desired – you can keep painting an overcoat to fix any imperfections. You should however, try to reduce the number of overcoats, after all, we’re dealing with micro sizes and weights, and thick – heavy paint jobs add weight, plus there’s a tendency for the paint to run more. Once finished painting the base coat and body designs (if any), it’s time to remove the masking on the effects masks like your grill and headlights and get those painted. It’s important to take your time with the details. They’re easy to screw up and at this point, that usually means starting over from scratch. 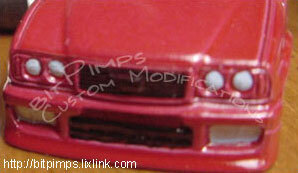 Doing this will add a lot of detail to your car and overall design, which will equate to a more appealing Bit. After you have everything painted, you might notice ‘creases’ in the paint where masks where, this is especially true for air brush painting. For this, you should use paper to rub gently over the area until it is smooth. Basically, you’re sanding down the creases, but the trick is to use something that is not too abrassive, otherwise you’ll end up taking off paint and adding scratches! If you rub to hard with the paper, you might notice the two colors blending together, it is important to rub gently. 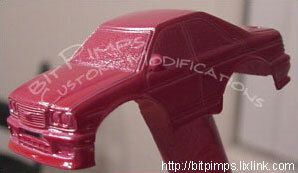 When you’re finished, add a clear coat to protect your paint job from scratches and other paint enemies. 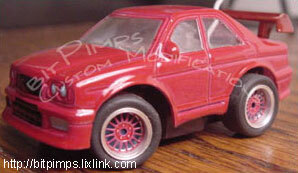 This entry was posted on Tuesday, January 28th, 2003 at 11:13 pm	and is filed under Micro, Mini, Painting. You can follow any responses to this entry through the RSS 2.0 feed. You can leave a response, or trackback from your own site.